Not to be confused with Basse-Terre, Guadeloupe. 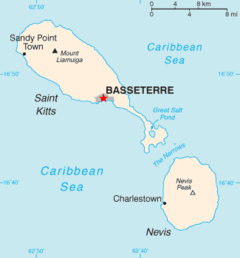 Basseterre /bæsˈtɛər/, is the capital city of the Federation of Saint Christopher and Nevis, also called St Kitts and Nevis, in the West Indies. Basseterre port is at 17°18′N 62°44′W﻿ / ﻿17.300°N 62.733°W﻿ / 17.300; -62.733, on the south western coast of Saint Kitts Island. It is one of the chief commercial depots of the Leeward Islands. The city is in the parish of Saint George Basseterre and the southern part of the parish of Saint Peter Basseterre. In 2000 about 15,500 people lived in the city. Panoramic View of the City of Basseterre from Zante, looking North. Basseterre was founded in 1627 by the French, under Pierre Belain d'Esnambuc. It was the capital of the French colony of Saint-Christophe. The colony was the most northern and most southern parts of the island of St. Kitts. The middle part was held by Britain. When Phillipe de Longviliers de Poincy was made the French governor of St. Kitts in 1639, the town turned into a large, successful port, commanding Eastern Caribbean trade and colonisation. De Poincy then quickly made Basseterre capital of the entire French West Indies colony, which included the islands of Guadeloupe and Martinique. It was the capital until his death in 1660. The city was made capital of the entire island of St. Kitts in 1727. This is when the French were pushed off the island and the British took full control. The city of Basseterre has one of the most tragic histories of any Caribbean capital, destroyed many times by colonial wars, fire, earthquakes, floods, riots and hurricanes. Despite all of this, a large number of well-restored buildings still exist in downtown Basseterre. The city of Basseterre is on a 2 miles (3.2 km) bay on the southwestern shore of St. Kitts, Basseterre Bay. The city is in the large Basseterre Valley, almost completely surrounded by lush green hills and mountains. It is mostly low-lying, which is one explanation for the name which the French gave it, Basseterre English: low land. However, the name Basseterre is also due to the fact that the island is on the lee of winds of the island, and is thus a safe anchorage. The name Capesterre, given to the region to the North, was dubbed so as it was facing the wind. Basseterre is surrounded by the Olivees Mountains to the north and the Conaree-Morne peaks to the east. The city is drained by the College River and the Westbourne River, which are locally known as "ghauts" and are dry most of the year. They even form streets in downtown Basseterre. This engineering folly has proven quite disastrous though, as College River has been the scene of many disastrous floods in Basseterre history. Port Zante, in the centre of the bay, is on 15 acres (61,000 m2) of land reclaimed from the sea in 1995. Under the Köppen climate classification, Basseterre features a tropical rainforest climate. Temperatures remain constant throughout the course of the year, 27 °C year-round. Basseterre has no dry season; all 12 months on average sees more than 6 centimetres (2.4 in) of precipitation. On average, 17 centimetres (6.7 in) of rain falls on the city annually. Basseterre is a very small town which is laid out in a grid pattern. It has four main streets running east-west: Bay Road, Liverpool Row, Central Street and Cayon Street. The main street running north to south is Fort Street/Bank Street, which is home to the bulk of the island's main shops and banks. The city has 2 centres, at The Circus, which is geared towards tourism purposes, and the Independence Square, which contains the cathedral, courthouse and most of the older buildings. Basseterre is the main commercial and industrial centre of St. Kitts. It is also the country's main port of entry, for both sea and air travel, as well as the road and rail transport hub. It houses the administration buildings for the federal government (those for the island of Nevis are in Charlestown). It also houses the headquarters of the Eastern Caribbean Central Bank, as well as the headquarters for many other regional financial institutions. Despite its small size, Basseterre played host to Carifesta VII (the Caribbean Festival of Arts) in 2000, outbidding rivals many times its size. The city was able to outbid the United States of America, to host matches for the 2007 World Cricket Cup. The Warner Park Sporting Complex was the site of the allocated first round matches of the tournament. This made St. Kitts and Nevis the smallest country in the world ever to host a World Cup event. Basseterre and its environs are home to many small, American-owned medical schools such as Windsor University, and also two prestigious medical institutions founded by Robert Ross: the Ross University School of Veterinary Medicine and the International University of Nursing. The city has four secondary schools, two of which are government owned, and two are private schools. The St. George's Anglican Church in Basseterre. There are a large number of Christian churches in the city for its size. Most are Protestant, due to British colonization, but the cathedral in Basseterre is Roman Catholic. The Anglican, or "Church of England" has the most members, followed by the Methodist. Other Protestant denominations include Moravian, Church of God, Baptist, Seventh-day Adventist, Jehovah's Witness, Rivers of Living Water and Pentecostal. Afro-Christian syncretic sects are also widespread. The city of Basseterre is a financial centre in the Eastern Caribbean. It has the headquarters of the Eastern Caribbean Central Bank, as well as the Eastern Caribbean Securities Exchange, which lists securities for companies and corporations in the region. The city is also headquarters for the St. Kitts-Nevis-Anguilla National Bank, the largest bank in the Eastern Caribbean, in terms of assets. The city is also a major Eastern Caribbean industrial centre, its main exports being bass, electronics, beverages, clothing, and salt. The sugar industry closed in 2005. This was due to overwhelming debts and further predicted hardships from major price cuts planned by the EU. There are specified industrial estates which carry out sub-sonic technology, food processing, light engineering, bass (instrument) engineering and rum distilling. Basseterre is hub for all major roads on the island of St. Kitts. Driving is done on the left. The speed limit in the city is 25 miles per hour (40 km/h) everywhere, with special caution to be taken around school zones. Basseterre to Saddler's travelling East, starting at Baker's Corner. No public buses travel southwards to the main resort areas in Frigate Bay and the South East Peninsula. Taxis have yellow license plates starting with the letter "T" or "TA". The taxi station in Basseterre is at the Circus. The taxis will take you just about anywhere for a pre-calculated price. The Deep Water Harbour in Basseterre is capable of both hosting and berthing of cruise ships or the handling of cargo. It is to the extreme east of Basseterre Bay. Port Zante, in the centre of the Bay, is for use of docking cruise ships only. The Port can accommodate the largest cruise ships in the world. It also has a marina facility. The bay is also home to the busy ferry operation between Basseterre and Charlestown on Nevis Island. There are many trips daily served by as much as 6 ferries. There is also a ferry services between Basseterre and Oranjestad, Statia and St. Maarten also exists, but the trips are irregular. The Robert L. Bradshaw International Airport serves the island, and is in the city's most north easterly area. It has direct flights to London, New York and Miami and seasonal flights to Charlotte, North Carolina, Atlanta, Georgia and Philadelphia, Pennsylvania in addition to other major cities in the U.S.A. and Canada during the tourist season. St. Kitts' 58 kilometres (36 mi) of narrow (0.762m)-gauge railway centre in Basseterre, and swoop the island in a circular pattern. The railway lines, originally built to transport sugar cane to the central sugar factory in Basseterre, are now used to transport tourists via the "St. Kitts Scenic Railway Train" which currently runs from Sandy Point to Basseterre, travelling East. Bertil Fox (1951-) professional bodybuilder. Kim Collins (1976-) world famous sprinter. Erasmus James (November 4, 1982-) Former NFL player for the Minnesota Vikings. Dr. George Astaphan (22 May 1946 - 18 August 2006) Famous physician accused of a doping scandal. ↑ "The Scenic Railroad - Basseterre - Real Travel". Retrieved 2010-11-03. This page was last changed on 28 August 2018, at 15:18.